Rockies uses a combination of two-row pale and Baird's crystal malts to produce this medium-bodied red ale. Nugget hops are added at the beginning of the 90 minute boil primarily their bittering contribution, while Willamette hops are added in the middle of the boil for both bitterness and aroma. David uses Cascade hops in the whirlpool to give Igloo its subtle, hoppy nose. He uses a proprietary yeast strain and won't divulge what secret spices are used during the boil to give this red ale its Christmas zing! Immediately note a full caramel and slightly hoppy nose with a roasted background in this clear, dark amber, medium-bodied ale. We picked up a toffee flavor throughout as well as traces of cinnamon and nutmeg and a roasted bitterness at the finish. It seemed to be more of a brown ale or ESB than a red. Overall, a great combination of malts, hops and spices in this very seasonal Christmas Ale. Founded by two homebrewers on a farm near Longmont, CO in 1979 and currently the oldest operating microbrewery in the United States, the Rockies Brewing Co. is nestled in the foothills of the Rocky Mountains in Boulder, Colorado. Since new owners Gina Day and Diane Greenlee took over the brewery and reformulated the product line with the assistance of David Zuckerman in 1990, the brewery has grown at an impressive 600 %, placing it #221 on Inc. Magazine's List of the 500 Fastest Growing Private businesses. 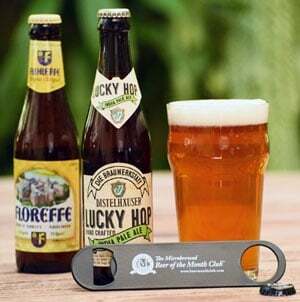 The brewery's mainstay award-winning product line has received 2 Gold and 2 Silver medals at the Great American Beer Festival and includes an extra pale ale, porter, nut brown, premium ale, amber ale, stout, golden ale, and a red ale. In addition to Boulder Igloo Ale, the brewery also produces several other seasonal beers including Boulder Cliffhanger Ale, Boulder Fall Fest, and Boulder Flatirons Extra Special Bitter. For more information about the brewery and scheduled tours, call (303) 448-8448 or check out their web site at www.boulderbeer.com. This fabulous eggplant dish is exceptional served with fresh pasta. Don't be shy about experimenting if you are unfamiliar with tamarind. Its unique, piquant flavor is well worth trying. Cut stem end off of eggplants. Slice into 1-inch rounds and place in salted water. Soak for 15 minutes to remove any bitterness. Drain and pat dry with paper towels. Brush on both sides with flavored oil and let stand while heating the grill and preparing the sauce. In a large heavy skillet heat ¼ cup olive oil over medium-low. When hot, add red bell pepper, onion, shallots, and garlic, cooking just until soft and transparent (do not brown). Add the Tamarind-Beer Syrup, ginger, and curry paste. Continue to cook until thick and chunky. Remove from heat and cover. Grill eggplant on medium-high until golden and soft when pierced with a fork. Serve immediately with the Tamarind-Beer Sauce. Note: Flavored oil can be made by heating oil on low and adding one of the following: mashed garlic, shallot, dried chili pod, or annatto seed. Cover and set aside for a few hours. BUSINESS WEEK - Are you an "Average" American? Got some scary news for you if you think you are. Business Week reports that an average American will drink 20,300 bottles of beer during his or her lifetime. That's equivalent to two bottles of beer a day for 28 years. For those who are concerned that they may be "below average", we're introducing our new keg of the month club in the near future. AMERICAN HOMEBREWERS ASSOC. 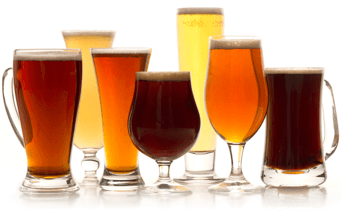 - The AHA reports that homebrewers in the U.S. brew about 8 gallons of beer a month. Incidentally, they've also informed us that 95% of homebrewers in the U.S. are men. What's up ladies? YORK UNIVERSITY - The world's strongest beer, Uncle Igor's Famous Falling Over Water, brewed by the Ross Brewery in Bristol, U.K., is 17.3% alcohol by volume. Holy Bat-Buzzes Batman! The most expensive beer ever sold on first offer from the brewery (as opposed to aged, rare, collector, and vintage specimens) is Samuel Adam's Triple Bock which at one time went for $100 for a case of 24, six ounce bottles. I've actually got two separate questions for you, if you can fit it in your busy schedule of gnawing on rawhide and lapping up your no doubt complimentary shipments from Microbrewed Beer of the Month Club. I've recently moved to Texas and have noticed that Longneck bottles are far more prevalent here than anywhere else in the country. Can you shed any insight as to why this may be? Secondly, and not related in anyway whatsoever, what's the difference between "cold-filtered" and "draft" beers? Does my acute canine sense of smell detect an air of attitude with your opening statement? I do a lot around here. Product research and Quality Assurance are two areas I take damn seriously. And by the by, let's get one thing straight. Not only do I get a complimentary subscription, I get pallets of beer ... to my bowl ... when I want it ... and served in my favorite stein cause I am the Main Mutt (main mutt in bold) at Corporate if you get my meaning. So, what was your question again? Sorry, you got me all frothy here. Texas. Longnecks. Right. On the longneck thing, I really have no idea, however I suspect that it's some kinda phallic, cowboy-related subliminal deal suggestive of one's manliness. On your other inquiry, all beers are cold when they are filtered. Cold-filtered implies "fresh", and naturally draft beer means "very fresh". Both are really no more than slick marketing terms used by the big boyz to woo the general public into consuming mass quantities of their otherwise lack-luster products.